Ayden Grace | OH SNAP! So I’m back on the blog! Woo! After no less than three of the blogs that I follow started posting about keeping your blog updated, I figured it was a sign. I did a shoot right at the end of the summer that was for a magazine submission, so unfortunately, we have to keep it off the web-sphere. It was centered around the latest take on Snow White, Snow White and the Huntsman. The costume design was so incredible and we knew immediately we wanted to do a shoot based off of it. Hair and Make-Up By the Lovely Kat! It’s been a wild ride since I started at SCAD last fall. That’s the reason I’ve been absent from the blog(s) lately, so I’m sorry about that. Either way, I’ve been swamped with shoots and have decided to showcase one of the more recent shoots with you. The project was conceived as a my Color Technique final for the quarter and was more about playing with spectrum’s of light we don’t normally play with as photographers. It was a complete experiment and I ended up having to shoot this three different times. Yikes! 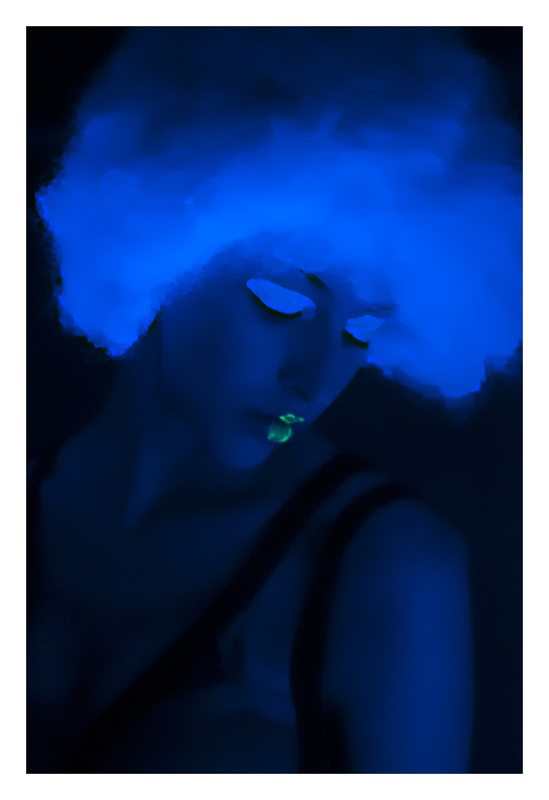 The first time I shot this I ordered an industrial 400 watt blacklight to work with. Considering the average Spencer’s bulb is 25-40 watts, that’s a lot of power. We got everything set up and my assistant Jessica was setting up the light. It never turned on. We waited two and a half hours for the thing to turn on. By that time, the models were there and were getting fitted for the clothes so we were down to one option: run out and get Spencer’s lights. That’s what we did! We ended up purchasing four lights to make this all work. Just goes to show you can’t pre-plan everything. I got this idea over the summer and worked on it with the lovely Sera Rose and Kayla Fenwick, both people I’ve never worked with before. My friend Jennifer Weightman was my assistant. Kayla was such a fantastic MUA and I really hope to work with her again. Sera was fantastic as well, a great poser and totally wiling to lie in gull poop, go swimming, wear dresses that were falling apart. Jen was hilarious and really helpful. It makes it so much easier when you have an assistant who is also a photographer and knows what you are talking about. The series focused around recycled fashion and how we (as consumers) can create beautiful products out of materials we use everyday. The black dress is made completely from contractor bags swiped from (empty) construction sites. Took me approximately…..three days, including patterning for the top, a muslin, and finished ruffles/pleating and five contractor bags. The white dress is made from (clean) kitchen trash bags and Target bags. That took me two days. Fairly easy, just started cutting away what I didn’t want and figuring out a shape. This was one of the first shots of the day. At this point, only the pleating at the top of the dress was starting to come undone, so it wasn’t too bad. I hadn’t really thought about how the pleats would come apart when I made the dress so it was interesting to see where my craftsmanship was the poorest. The skirt is huge, approximately….four feet of train? I got really inspired by a shot of Kiera Knightly by Vogue in Africa, where they had her in a ruffled linen skirt. So beautiful! Towards the end I decided to risk everything and put my precious baby as close to the water as possible without getting wet. O.O So much worry. I used the Live View mode in my camera (thank god) to make sure that the composition was how I wanted it. Thank you Nikon for inventing and then including that on pro-DSLR’s. One of the last images from the day. We lost the sun for an hour or so and this was one of the moments where it was peeking out for .45 seconds. I had Jen on sun spot. She would yell when she saw it, we’d swim over to the point and try to snap some frames in before it dissipated again. Working against light + wrap time + sun = NOT EASY. But it was fun and the image was beautiful. Again, another image that got color corrupted between LR and PS so it took me five edits before I figure out the problem(s) (Two, one with the color profile and one with the working space). Still not exactly sure what went wrong seeing as how I used the same processes for the top two images as these two, but eh, as long as I can fix it I’m happy. All of these excuses are not only wrong, but they are also potentially costing the photographer tens of thousands of dollars. This article will explain why registering your photos with the Copyright Office has never been easier–and how a registration could mean the difference between getting rich or getting ripped-off. all the photographs have the same copyright claimant. If you would like to register more than 750 photographs, you can still do so with a single filing fee using Form VA if you identify the date of publication for each photograph on the images deposited with the application. Anyone who says that registration is too difficult simply hasn’t done it. It is sometimes time consuming, but if you know your name, address, citizenship, and the year of creation of the photos, you have the intelligence to register your photos with the copyright office. The Copyright Office has a number of circulars that explain how to fill out the form, including a few specifically addressed to photographers. And the Copyright Office is currently allowing, on a trial basis, electronic registration of groups of published photographs. To be eligible for this trial, call the Visual Arts Division at (202) 707-8202. It is true that the photographer owns the copyright immediately upon creation. But as a practical matter, registration is imperative if you want to be able to sue someone for infringing your work. That is because the Copyright Act gives the photographer different forms of relief, depending on whether the photo was registered at the time of the infringement (or within 90 days of the photo’s publication). If a registered work is infringed, the photographer can claim statutory damages of up to $30,000 and of up to $150,000 if willful infringement is proved. The photographer can also recover his attorney’s fees, which easily add up to tens of thousands of dollars. But if the photographer did not register the photo before the infringement (or within 90 days of publication), then he can recover only his actual damages, plus any profits of the defendant attributable to the infringement. Let’s take a hypothetical case and see how that plays out. Mary, an aspiring nature photographer, posts photographs of her trip to the Grand Canyon on her blog. One of her photos is taken by an unscrupulous ad agency and used in the background for a series of travel brochures. If Mary wants to sue, all she could get would be her actual damages. Because Mary is not yet an established photographer, her best sale to date was for $1,000. So, if she sued, the most she could get would be $1,000 (or possibly some small multiple of that). But because her attorney wants $10,000 to file the case, it doesn’t make economic sense for her to file the lawsuit. It will cost her more than she would ever recover. Although, in theory, Mary could also obtain the infringer’s profits related to use of the photograph, the reality is that proving those profits would be very expensive. The process would almost certainly cost more in expert’s fees and attorney’s fees than she would ever recover. As a result, Mary does not file a lawsuit and ends up recovering nothing. In this case, Mary can seek statutory damages for willful infringement. And she can obtain attorney’s fees in the lawsuit. She hires a lawyer (who is now willing to work on a contingency-fee basis). The lawyer writes a letter to the advertising agency. A little back and forth, and the matter is settled for $20,000 a few weeks later. Not a fortune, but a nice payday for the use of one photograph. Now, obviously, this scenario is just an example, and the results will change depending on a number of factors. But as a general rule, the $35 spent on registering your photos with the Copyright Office will be the best money you ever spent. So, DeviantArt asked today about going back to school and I figured you guys would be interested in my responses! They have an interview included as well here. How well do you feel that the arts institution in which you are currently enrolled is serving your intended purpose? This will be my first year at SCAD in Savannah, and I previously attended CSM in Maryland in the past year. While CSM was interesting, it was liberal arts program and not very dedicated to its’ art students. They tried, and had great faculty, but overall it was a disappointment. SCAD SAV however, seems to be right up my alley. They were willing to take me aside the three times I went down and review my portfolio and talk to me. The students were friendly and exciting to be around. What is your advice to other deviants considering enrollment in an arts school? LOOK! Don’t be too swept away by all the hype of people saying their school is better. The school that is best is the one that gets you. I went to SCAD three times before making my decision after looking at Pratt School in NY, Arcadia in Pennsylvania, the Antonelli Institue, Hallmark School of Photography, Art Academy of San Francisco, the Art Institutes and Columbia College Chicago (gosh it doesn’t seem like that many). I got told by a lot of other people that one school was better for this reason, or that reason, but it didn’t matter. How much emphasis is placed on the arts as an essential part of any student’s general education in your school? I graduated from high school two years ago, and I have to say, the Arts were getting the short end of the stick. We had a core student group of maybe nine or ten, and the classes were filled with people who had simply been put into the class, even the Advanced Placement classes. They didn’t do work and often broke things they were supposed to be touching in the first place. We were always short on funding, had a lack of supplies and an overall lack of leadership from the department chair. However, the faculty was wonderful and I really bonded with them. In your art classes, do you feel you are acquiring the skills and information that could lead to a real career in the arts? It really depended on the teacher. Two of the four teachers I felt like I was getting real world application, and the rest, not so much. I had a spontaneous photoshoot with fellow shutterbug Jennifer. She and I went to high school together and were in the same AP Studio class. She has the most amazing photography and we’ve been wanting to shoot together for….ever. She also has fantastic style! So, I recently did a test shoot based off of several of my favorite photographers. It got me thinking about my readers and how photographers (whether amateur or otherwise) might be interested in how to take inspiration from great photographers and then turn it into something that is uniquely theirs and no-one elses. Without further ado, the post. 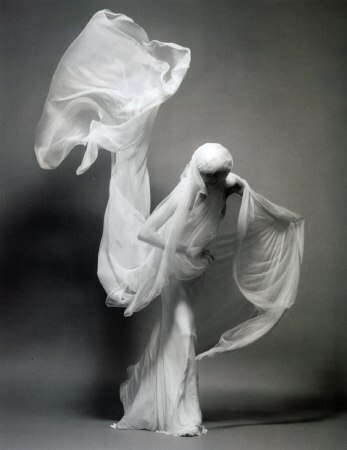 The fabric test shoot really came to being when I was introduced to Solve Sundsbo’s work called ‘The Ghosts of Fashion’. A lot of the work I collect on my hard drive is great work but every now and then I get a piece I absolutely love and this was one of those sets.The way the fabric moves across the model, the exquisite draping…it all makes for a great photograph. I knew instantly that I wanted to create a work that embodied that movement and now I just needed to make it my own. One of the ways I do this is by pulling from other photographers. Zhang Jingna’s work was pulled from my hard drive into an ‘Inspiration Folder’ that I have for every shoot–it’ll have everything from my mood boards, to my sketches of final results, and photographs from other photographers but sometimes it’s as little as a single photograph and a color. It’s like tracing, for me. I trace the original image, then, I trace the traced copy, and then again and again until what I have looks beautiful in it’s own right, may be similar to the original, but stands on it’s own. That’s the way this process works, you build and build and build–when your a pro, or working on a large shoot it’ll be building on the make-up artist, the content editor, the designer, the client, the art director, ect.’s ideas–and then you end up with an original piece. Of course, it’s always nice to credit the original piece–but that may not always be possible. Clarification time, this post, in no means, is supporting the copying of someone else’s work. It’s wrong and it doesn’t mean that your ‘inspired’ by them whatsoever. Turning someone’s color photograph into a black and white, or vice versa, doing some small post-production editing or even large scale production, doesn’t count. If it’s copyrighted, if it’s taken by someone else, then it’s not yours to mess with. So by this point, you should be able to see where I am referring to when I reference the above images. After I have the images in my mind, it all comes down to getting the model, the make-up artist, my assistant and myself to work together to create the final product. I was really interested in doing something with a royal blue and I also wanted a soft fabric with a lot of movement. After looking through dozens of yards of fabrics at Jo Ann’s I selected a navy chiffon. It moved really well when I unrolled it. For this shoot, I also knew that I was going to need a large amount of fabric and I ended up with 9 3/4 yards of fabric. When we started with the shoot, Jacob (my assistant) and I were playing with it and discovered that we need to cut the fabric into two parts for greater movement. It kept getting stuck around our legs otherwise! 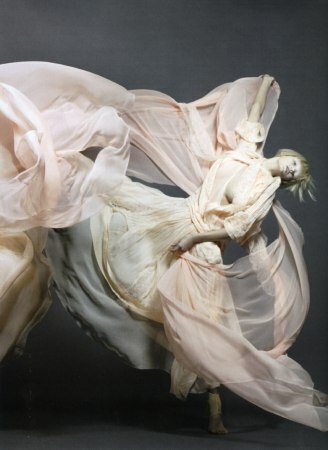 Zhang Jingna Featured in Elle! My favorite fashion photographer was featured in Elle Mag Singapore as no. 5 in the top 10 upcoming people !! Whoot! You need to check her out! !